On 5 May, President Medvedev visited Alabino’s 5th Guards Taman Independent Motorized Rifle Brigade (formerly division), a traditional showcase and test bed formation for new equipment and concepts. 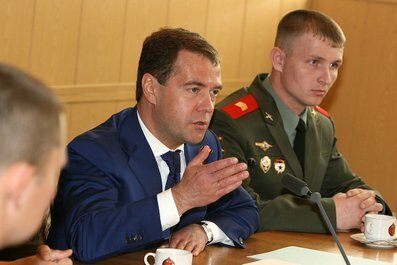 Medvedev and Defense Minister Serdyukov followed up the latter’s late April meeting with the Committee of Soldiers’ Mothers and other public representatives about ‘humanizing’ the armed forces. At that time, Serdyukov presented ideas for driving the ‘spirit of the prison camp from the army.’ They included freeing soldiers from additional duties to focus completely on training, allowing them more free time, pushing reveille and lights-out back an hour, mandating a rest hour after lunch, instituting a 5-day conscript working week, allowing the possibility of draftees serving close to home, and obtaining weekend passes to leave the garrison. Alabino is a place where things like these are typically tried out. As Rossiyskaya gazeta put it, Medvedev went to Alabino to see how conscripts live in ‘new profile’ conditions. He inspected the training grounds, classrooms, and barracks, and answered questions from the new soldiers themselves. Medvedev and Serdyukov addressed physical training, one-year conscription, contract service, weekend passes, mobile phones, and hiring civilians to perform nonmilitary support services. Taman Brigade Commander Andrey Ivanayev told the Supreme CINC about the experiment with intensive physical training (PT) in his formation. Ivanayev indicated the troops formerly had 53 hours of PT per year, but now get 4-5 hours per day, or about 25 per week. He and Medvedev discussed how soldiers are separated into groups by the physical load they can handle. In the Kremlin.ru transcript, Ivanayev said in April testing there were only 88 negative PT evaluations. According to RIA Novosti’s reporting, Ivanayev thinks the formation’s fitness level has already increased 50 percent. But a little math says that is closer to Gerasimov’s figure, or 64 percent of officer pay . . . This policy is especially interesting . . . the possibility of the weekend pass is predicated on several things not really discussed during the Alabino visit. Working backward, the pass depends on successfully implementing a five-day working week for conscripts. Then on having conscripts serving relatively close to home in the first place. At least one voyenkom has already said conscripts from his republic don’t have this chance because they all serve outside their home borders. A prized weekend pass could also become one more thing to be bought and sold to the highest bidder, or briber. If implemented, this policy will be difficult to maintain in the face of soldiers who don’t return to the garrison or get into serious trouble while away from it. Gerasimov added that in the Moscow MD anyone may have a cell phone, but they may not be used during training or duty time. Discussing training and physical conditioning, Serdyukov turned to one of his earliest initiatives at the Defense Ministry—relieving soldiers from essential nonmilitary duties like kitchen patrol, cleaning, groundskeeping, and utilities maintenance. Civilians already take care of the Taman brigade’s food service, and soon they will maintain its engineering networks, and provide cleaning services. Serdyukov indicated the FSB is working on licensing firms to work in closed facilities, and Oboronservis will work in remote garrisons where contractors can’t be found. This entry was posted in Conscription, Ground Troops, Manpower, Serdyukov's Reforms, Training and Exercises and tagged 5th Guards Taman Independent Motorized Rifle Brigade, Alabino, Anatoliy Serdyukov, Andrey Ivanayev, Contract Service, Dmitriy Medvedev, Taman Guards, Valeriy Gerasimov. Bookmark the permalink.